A group of 29 countries called for the Venezuelan government and opposition to engage in renewed national dialogue Thursday, amid calls for more US sanctions against the South American country. Led by the right-wing government of Paraguay, the international group including the US and UK called on President Nicolas Maduro to “ensure the full respect of human rights, due process, the separation of powers and the consolidation of a representative democracy”. 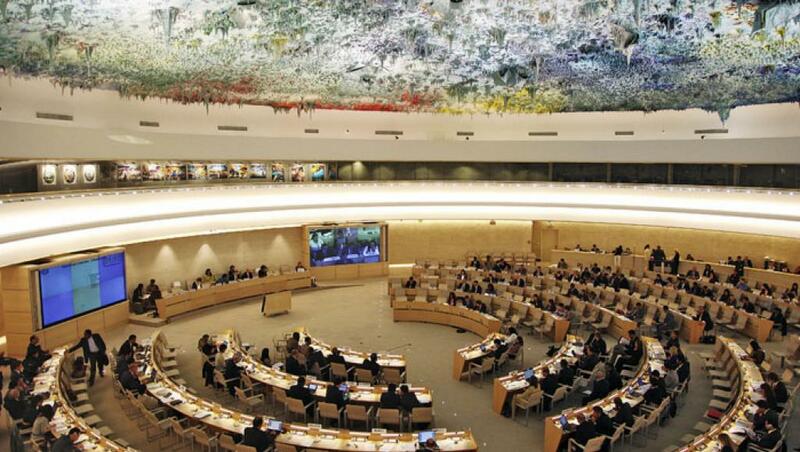 Issued during a meeting of the UN Human Rights Council (UNHRC) in Geneva, the statement also called for the Venezuelan government to ensure the organisation of a presidential recall referendum. Venezuela condemned the declaration as “interventionist”, while its regional allies drew support outweighing the Paraguayan statement. A call from Cuba for respect for state sovereignty drew the support of 88 countries. Maduro described the outcome of the UNHRC meeting as a “great victory” for Venezuela. “To their 29 votes, we got 88,” he said. The fiery session Thursday was the latest in a series of jabs at Venezuela over the course of the meeting. When the UNHRC forum began on September 13, UN High Commissioner for Human Rights Zeid Ra’ad al Hussein lashed out at Maduro’s government over “allegations of repression of opposition voices, arbitrary arrests and excessive use of force against peaceful protests”. A major anti-government rally two days later drew thousands of opposition supporters to the streets of Caracas and other major Venezuelan cities, with no signs of widespread police crackdowns or repression. Another large rally is scheduled to take place on October 12. The controversy at the UNHRC followed weeks of bad news for Venezuela’s international relations. Earlier this month Venezuela was barred from its position as president of the South American trade bloc Mercosur, while Maduro’s hosting of a summit of the Non-Aligned Movement failed to draw more than a handful of international allies. Then on Wednesday, US lawmakers issued renewed condemnation, and calls for new sanctions on Caracas. On Tuesday, the US House of Representatives passed a resolution calling for the release of “political prisoners” in Venezuela. “This resolution states in no uncertain terms that President Maduro’s shameful and rampant corruption in Venezuela must end,” said Florida Representative and former chairperson of the Democratic National Committee Debbie Wasserman Schultz. Schultz herself faced allegations of corruption earlier this year, after whistle-blower website Wikileaks released documents that appeared to show Schultz and other leading party officials failed to maintain impartiality during the Democratic primaries. The day after the House issued its latest Venezuela resolution, long time anti-Venezuela campaigner Senator Marco Rubio called on President Barack Obama to authorise sanctions on government officials including the head of Venezuela’s National Electoral Council (CNE), Tibisay Lucena. Rubio claimed Lucena and other top officials have “committed significant acts of violence or human rights abuses”. Lucena herself has no oversight over Venezuela’s security forces, which have been accused of human rights abuses. Nor has she directly been involved in the arrest of opposition political figures such as Leopoldo Lopez, who was imprisoned in 2015 after a Venezuelan court found him guilty of inciting a wave of deadly violence. As head of the CNE, Lucena has been criticised by opposition supporters, who say her organisation has dragged its feet on preparing for a presidential recall referendum, which could lead to Maduro being forced from power early. CNE officials have responded to the complaints by arguing the opposition itself has slowed the referendum by allegedly including bogus signatures in a preliminary petition that was required to prompt a recall vote. Last week, the CNE confirmed the referendum would not be possible until next year, dashing opposition hopes of forcing new elections. The timing of the referendum is significant: if it takes place before January 10, 2017, Maduro could be forced from office, and snap elections held. If the referendum is held after this cut off point, Maduro will simply be replaced by his vice-president for the rest of the normal presidential term. The CNE’s handling of the referendum has also been criticised by the US, prompting backlash from the Maduro administration. In a bid to ease tensions, the US and Venezuela are expected to hold new diplomatic talks in the coming weeks. According to a report from the Associated Press this week, the talks will include Venezuelan officials and a US Department of State official. The official was named as Thomas Shannon, the state department’s current undersecretary of state for political affairs. No further details of the meeting have been released, though another recent meeting between Venezuelan officials and US Secretary of State John Kerry reportedly focused on the detention of Joshua Holt. A US national, Holt was detained by the Venezuelan military in June, under allegations of stockpiling firearms in the home of his wife in Venezuela. Holt’s relatives have denied the allegations.